My father recently noted I've become a spider, he might be right. Across the table from him, I am spinning a fine white line from cotton fluff. 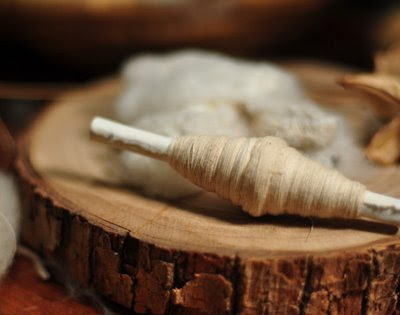 Since spring, cotton has become one of my favorite fibers to spin. While at a handweaver's conference last March, I had the good fortune to meet an incredible spinner who specializes in spinning cotton. At every opportunity I sat at her booth, surrounded by mounds of the softest cotton roving, and watched mesmerized as she spun by turns on her spinning wheel and takli. Fluff turned to thread in long stretches, little slubs deftly smoothed out into fine lines as if by magic. The process from the outside is mysterious and the effect hypnotic. Joan, the spinner, wore an exquisite blouse made from cotton grown in her garden, hand spun and handwoven. She explained that while the spinning wheel was essential for speed, the takli was her preferred tool for spinning warp threads because they could be spun more finely and then plied for strength at the same thickness as a weft thread spun (and used as a single) on a wheel. In just the span of a couple short days, I had become the student of a Spider. 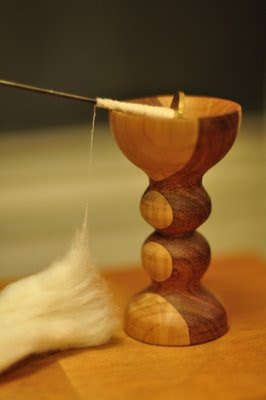 For months since, I've carried this little spindle, a lap bowl, and cotton fluff everywhere. When the opportunity arises, I sit and draw a fine fine thread from the tips of my fingers on one hand as the other flicks the spindle to spin. It stretches up and out as far as I can reach before I twist it onto the shaft of the spindle. Whenever visiting friends, watching movies, waiting for a table at dinner, or riding in the car it comes out and spins. My teacher, Joan, warned me simply to not to use it at auctions, as she inadvertently agreed to purchase a cow once. The takli sat in silence for a time after I managed to break it, but I've since replaced it and have been spinning again. Months after that first little flick of the spindle, I've spun just a couple of ounces of tiny thread which I'll ply together for warping my own loom someday. Perhaps you have more in common with your friend living in Bone Mother than you realize. This sounds amazing! Must be beautiful to watch you creating your spidery thread..